THE LEGEND OF ZELDA BREATH OF THE WILD NINTENDO SWITCH ITALIANO. La condizione Ottime condizioni. In arrivo in contemporanea al lancio di Nintendo Switch, il gioco rivoluziona i capisaldi che hanno caratterizzato la serie per 30 anni, mantenendosi però fedele al concept di fondo. Sganciando lo schermo della console dal dock e connettendo i Joy-Con ci si ritrova tra le mani la versione portatile del gioco, che non ha nulla da invidiare alla versione TV. Inklusive Box und SD-Karte. Nintendo Switch - ZELDA Breath of the wild. THE LEGEND OF ZELDA BREATH OF THE WILD. Regardez-bien les photos. Brand New Sealed. Condition is New. Text on Box is in German. I can 100% assure any buyer that the language of the game will reflect whatever your system language is. If you have set to English, that’s what it will be! i also got a German copy of yoshi, and it loaded up on my switch just like any other version of the game. I didn’t have to change language. I am also selling: Smash brothers Zelda Super mario bros switch Mario party All brand new and I’m willing to combine postage. THE LEGEND OF ZELDA BREATH OF THE WILD. LIMITED EDITION NINTENDO SWITCH. VERSIONE ITALIANA (PAL ITA) UFFICIALE ITALIANA. 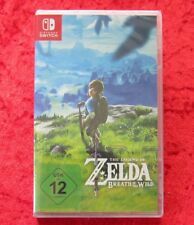 Here for sale is the legend of zelda breath of the wild for nintendo switch. Completed so no longer needed. Condition is very good, but as you can see in the photo there are some marks along the spine of the game. This was bought in the UK, so is PAL standard. But the switch is region free so will play on any switch. I will post worldwide using a tracked service. I am selling around a dozen switch games so please check out the other games. I will combine postage if multiple items won. No 0 feedback ebayers, bids will be cancelled and blocked. Any questions please don't hesitate to ask. Happy bidding. Master Edition di Zelda breath of the wild. la statua della master sword della rinascita, la mappa in tessuto, la moneta sheikah e il porta switch a forma di tavoletta sheikah. La limited edition include . The Legend of Zelda: Breath of the Wild rivoluziona i capisaldi che hanno caratterizzato la serie per 30 anni, mantenendosi per fedele al concept di fondo. CONDIZIONI DI VENDITA. QUINDI CHI ACQUISTA DALLE ISOLE MINORI E' INVITATO A TENERE CONTO DI TALE COSA. The Legend Of Zelda: Breath Of The Wild WiiU Vers. Italiana. Nuovo. Perfetto. Capolavoro e canto del cigno di una console sfortunata. 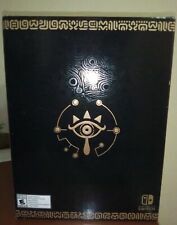 Legend of Zelda: Breath of the Wild MASTER EDITION (Switch) SIGILLATO!! RARO!!! Poco da dire. The Legend of Zelda: Breath of the Wild. MASTER EDITION (Nintendo Switch) ! Platform Nintendo Switch. È garantito che sia sigillata di fabbrica poiché ha il sigillo adesivo di fabbrica in cima mai aperto! The Legend of Zelda Breath of the Wild Limited Edition Nintendo Switch. All'E3 di quest'anno presenteremo anche nuovi amiibo della serie The Legend of Zelda: Breath of the Wild. The Legend of Zelda : Breath of the Wild - Limited Edition . Nuovi, mai aperti. Brand new. Al loro interno troverai enigmi di vario tipo. Supera le trappole e le sorprese che ti aspettano al varco per ottenere oggetti speciali e altre ricompense che ti aiuteranno nei tuoi viaggi. Potresti dover indossare degli abiti caldi per proteggerti dal freddo o dei vestiti più leggeri quando sei nel deserto. THE LEGEND OF ZELDA: BREATH OF THE WILD PER NINTENDO SWITCH NUOVO SIGILLATO. GIOCO IN ITALIANO. The Legend of Zelda: Breath of the Wild rivoluziona i capisaldi che hanno caratterizzato la serie per 30 anni, mantenendosi però fedele al concept di fondo. PAL UK VERSION - NUOVO SIGILLATO - NEW SEALED. Seriousness and professionalism make our staff one of the best in this field. You receive exactly what exposed in photo. The Legend of Zelda: Breath of the Wild rivoluziona i capisaldi che hanno caratterizzato la serie per 30 anni, mantenendosi per fedele al concept di fondo. Sganciando lo schermo della console dal dock e connettendo i Joy-Con ci si ritrova tra le mani la versione portatile del gioco, che non ha nulla da invidiare alla versione TV. Tocca il sensore NFC con un amiibo quando usi software compatibili con Nintendo Switch, Nintendo 3DS o Wii U per sbloccare nuove sorprendenti funzionalità! Se hai un amiibo compatibile, puoi usarlo per migliorare la tua esperienza di gioco in vari modi! Nintendo WIIU nuovo! The Legend of Zelda - Breath of the Wild. Dai un'occhiata a tutte lealtre mie inserzioni ! BELLISSIMO AMIIBO RARO DILINK A CAVALLO THE LEGEND OF ZELDA BREATH OF THE WILD NUOVO SIGILLATO, PERFETTO! Zelda Wii U Nuova, ancora sigillato. THE LEGEND OF ZELDA BREATH OF THE WILD NINTENDO SWITCH ITALIANO NUOVO. La condizione Nuovo. Spedito con Posta raccomandata standard. Compatibile con amiibo serie "The Legend of Zelda 30th. Anniversary", amiibo Link lupo e amiibo serie "The Legend of Zelda: Breath of the Wild". IMPOSSIBILE LA SOSTITUZIONE. (vostro diritto in base alla legge). 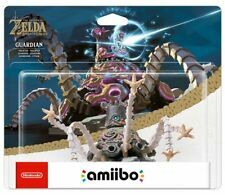 Amiibo della serie The Legend of Zelda: Breath of the Wild. Nintendo The Legend of Zelda: Breath of the Wild videogioco Basic Nintendo Switch Tedesca, Inglese, ITA. Più economici. In scadenza. Link utili. Auto e Pneumatici. The Legend of Zelda : Breath of the Wild. In conformità alla legge italiana della DECRETO PRESIDENTE REPUBBLICA 21 DICEMBRE 1996, n. 696 (n. 030 del 06/02/1997) Tale vendita non è soggetta all'emissione dello scontrino fiscale o ricevuta. The Legend of Zelda: Breath of The Wild - Limited Edition. Statuetta Master Sword of Resurrection. Map of Hyrule in tapestry material. The box contains.